Snap Out - Snap In Sensor Change ! The AlcoScan AL6000 Prestige Professional Breathalyzer (Sleek Silver) is one of our most popular quality digital semi-conductor breathalyzer units - Highly popular with the NHS due to its reliability and robust breathalyzer design and supplied by Breathalyser Direct to a large number of NHS trusts in the UK. Also, supplied by Breathalyser Direct to Granada TV Media for use on some very well known drama productions, you may have seen this model and other models from Breathalyser Direct on television very recently - Coronation Street, Eastenders, Stella to name a few ! This model was also featured on Channel Five's Fifth Gear Programme. The BBC purchased this model from Breathalyser Direct for use in the documentary series 'Dangerous Pleasures' : In 'Ready, Steady… Drink' - Emily Atack, who plays Charlotte Hinchcliffe in The Inbetweeners, looked at the UK's culture of drinking games and whether they should be banned. Emily investigated why young adults like to find new and more risky ways of drinking and she used an AlcoScan AL6000 Prestige supplied by Breathalyser Direct to test the programme participants. Of particular note was the frightening levels of alcohol still in the participants systems after just a few hours sleep - many were STILL over the UK Drink Drive limit after consuming vast quantities of alcohol until late morearlier in the evening. This model is also sold on competitor websites under different guises and variations on the AL6000 word. 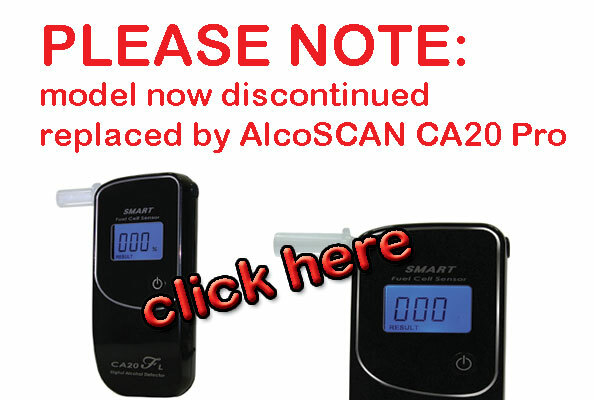 We only sell the AlcoScan Prestige Professional with user self calibration for high accuracy and reliability. 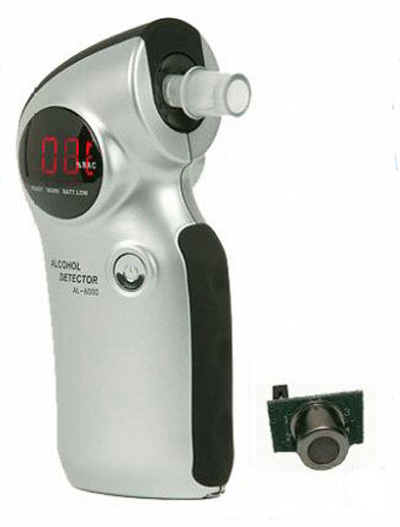 It is a highly accurate breathalyzer with a manufacturer's quoted accuracy of +/- 0.01 % at 0.10% BAC (Breath Alcohol Content) The only way to achieve better accuracy, should you require it, is with the AlcoScan AL7000 Premium (3 Decimal Places) or Professional Fuel Cell Devices ) like our AlcoVISOR range, Lion, Drager etc. When the AlcoScan AL6000 unit requires calibration, simply click in a pre-calibrated sensor module which includes a new air pathway. 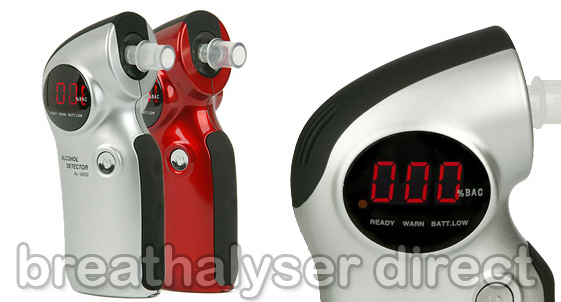 The breathalyzer is therefore always available, no down time for calibration. The breathalyzer comes with a precalibrated sensor already fitted and is ready for immediate use. Extra sensors may be purchased separately if required (Picture below shows sensor change). Please note that we only supply sensors calibrated in mg/l and red coloured base. If your sensor base is green (no longer made from 2007) then our sensor will not be suitable. Do not confuse this model with the older and cheaper style AL6000 as sold by some websites (particularly e bay) - The older version does not have the facility to click in a new sensor module. In addition, this unit is calibrated in mg/l meaning that there are 35 incremental steps up to the UK limit of 0.35mg/l. Other versions calibrated in %BAC (common in Europe/Ireland ) may not display as many incremental steps and are therefore less user friendly. The AlcoScan AL6000 Prestige offers high accuracy and sophisticated alcohol sensing technology making it extremely popular with companies and individuals requiring high precision and professional reliability. It is supplied with a custom pouch, 2 Free batteries and 5 reusable, fully washable plastic mouthpieces. Order this month, and receive an extra 10 mouthpieces for free - total 15 mouthpieces with each order. 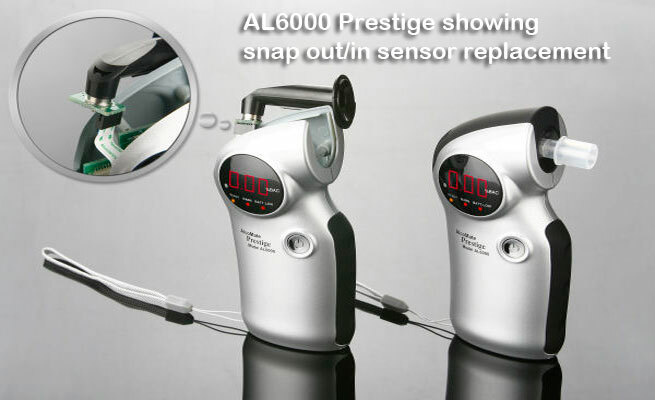 We now offer 'bundle' packages to include the AL6000 Prestige with extra mouthpieces for employee testing or the AL6000 Prestige with a spare pre calibrated sensor to minimise 'downtime' of your breathalyzer. Some competitor websites are still selling the old style AL6000 without the ability to replace the sensor. Current Users: US Coastguard, Universities, Schools, NHS, Military Police Forces Worldwide, Airline Pilots. Please note that if you require full Police grade accuracy then you should consider Alcovisor MkX/Mercury/Jupiter/Lion or Drager series.. See Top Menu for Details..